The Great Depression was a significant event in world history and of particular importance to American history. It was a worldwide economic recession that occurred primarily during the 1930s. In general, a recession is a downturn in the economy that is often accompanied by high levels of unemployment and a significant drop in consumer spending. Due to the economic crisis facing the United States at the time, the federal government undertook a high level of intervention in the economy in hopes of helping working-class people and restoring the American economy. This had a profound effect on the United States and resulted in a dramatic shift in American politics. The best example of this is the election of Franklin D. Roosevelt and the implementation of the New Deal. In general, most historians identify the stock market crash in October of 1929 as the start of the Great Depression in the United States. Beginning on October 24th, also known as ‘Black Thursday’, the New York Stock Exchange began to experience volatility and heavy trading which resulted in a large drop of the overall value of the market. Over the next several days, prominent American bankers attempted to slow the drop in the market, but all of their attempts only supplied temporary relief. Finally, on October 29th, also known as ‘Black Tuesday’, the market took another significant drop and the panic of the stock market crash reached its peak. In total, the market had lost over $30 billion with nearly $14 billion being lost on October 29th, alone. The crash saw the market lose over one third of its total value and led to several other major economic issues that furthered the recession. Herbert Hoover was the President of the United States at the start of the Great Depression and held a general view of the economy based on self-reliance. This means that he believed it was the responsibility of individuals to take care of themselves and not rely on assistance from the government. As such, he did not agree that the government should intervene in the economy and referred to the economic hardship of the Great Depression as “a passing incident”. As a result of his presidency, many working-class people began to name aspects of their poverty after Hoover. For example, shanty-towns that were constructed on the edge of cities in the 1930s were often referred to as ‘Hoovervilles’. In the 1932 presidential election, Hoover faced off against Democratic candidate Franklin D. Roosevelt. Roosevelt offered a completely different view of the recession and ran on the platform of a ‘New Deal’ for the American people. With unemployment over 20% in 1932, Roosevelt blamed the worsening economic conditions on Hoover’s mishandling of the crisis. As a result, Roosevelt won the election in a landslide victory and set to work creating his ‘New Deal’. The New Deal was a series of government initiatives and programs aimed at ending the economic devastation of the Great Depression. Many historians agree that the New Deal included two distinct stages. 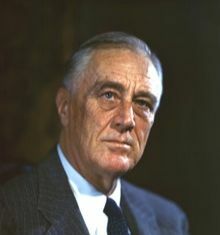 The First New Deal occurred from 1933, when Roosevelt took office, until 1934 and focused on issues related to banking. The Second New Deal occurred from 1935 until 1938 and focused on several important programs including the Social Security Act. In general, Roosevelt’s plan was for the federal government to spend money in an attempt to achieve three goals: economic recovery, job creation, and investment in public works projects. Roosevelt set about to achieve many of these goals within the first 100 days of his presidency. First, Roosevelt’s plan was to pull the United States out of the recession and to begin the process of economic recovery. During the Great Depression, banks were hit particularly hard and many did not survive the turmoil of the 1930s. Banks suffered due to the stock market crash because they were heavily invested in the market themselves. As such, they suffered heavy losses, along with many other businesses and investors. Since businesses, at this time, were scaling back their operations in order to save money, they began to borrow less from the banks which further hurt the ability of the banks to survive the crisis. 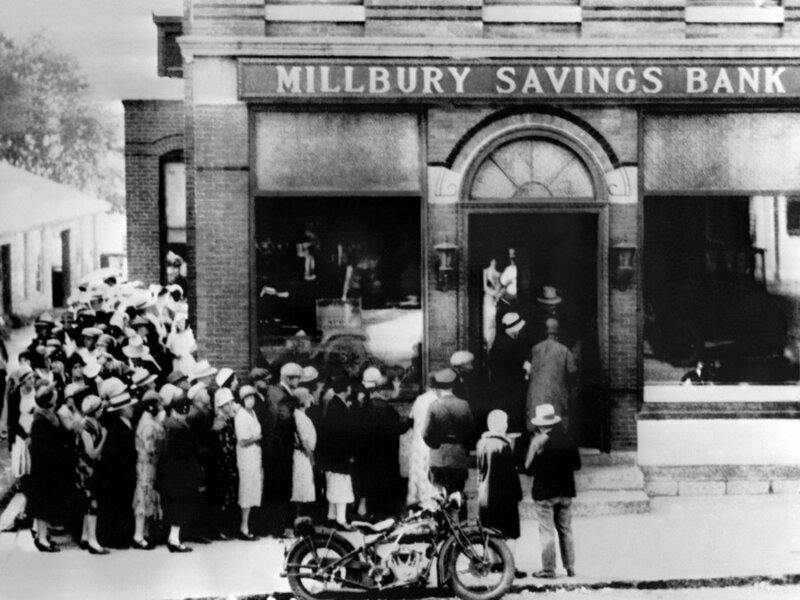 Amid all of the confusion and panic of the stock market crash of 1929, there was a series of ‘bank runs’. A bank run is when a large group of people attempt to pull their money out of the bank at the same time. It creates a crisis because the bank does not have enough actual cash on hand to provide everyone with their money, since the bank has used it to invest in other financial deals. Afraid they would lose their own savings during the stock market crash, people rushed to banks that were still open to withdraw their money. This massive withdrawal of cash caused banks to close and many were unable to reopen. ​In order to stop the banking crisis, on March 5th of 1933, Roosevelt ordered a bank holiday in which all of the countries banks were ordered to close. The goal was to stop bank runs and allow the federal government time in order to pass new legislation to stabilize the banking system in the United States. For example, on March 9th, the Emergency Banking Act was passed by Congress. In general, the act created a process by which stable banks could reopen and made loans available if required. As well, less stable banks were merged with others and reopened with the support of the federal government. The reforms stabilized the banking system and ended the panic that led to the bank runs. Roosevelt further created a feeling of confidence in the system with his first ‘fireside chat’ on March 12th, 1933. 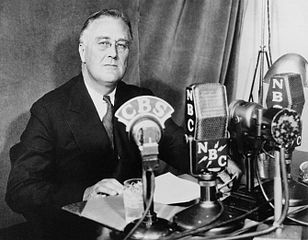 A fireside chat is the term used to describe a series of radio addresses that Roosevelt delivered through his time as President of the United States. In these addresses, Roosevelt spoke to the American public in plain terms about important issues facing the country. For example, his March 12th fireside chat was centered on the banking crisis and the reforms that his administration had introduced to restore stability. He talked to the country about his plans and eased the panic that had swept across the country. Throughout the rest of his presidency there were 30 total fireside chats on a range of issues. Next, Roosevelt spearheaded the creation of several programs which are often referred to as the ‘alphabet agencies’ in relation to their initials. For example, in 1933, the government introduced the Tennessee Valley Authority (TVA). It allowed the construction of a series of dams in the Tennessee Valley which served several functions, including: controlling flooding, providing jobs for workers, and creating electricity for local communities. As well, Roosevelt was concerned about the life of farmers during the Great Depression and worked to create the Agricultural Adjustment Act in May of 1933, which established the Agricultural Adjustment Administration (AAA). The AAA created policies to improve incomes for farmers. For example, the AAA paid some farmers to not grow a crop in a season in order to improve the overall price of that particular crop. As well, they oversaw the slaughter of 6 million pigs which were then discarded to increase the overall incomes for pig farmers. 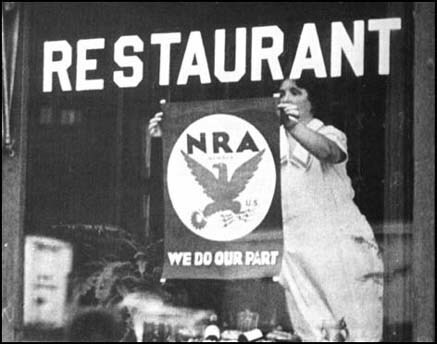 Also passed in 1933 was the National Industrial Recovery Act (NIRA), which created a set of rights for workers while also establishing the Public Works Administration (PWA) and the National Recovery Administration (NRA). 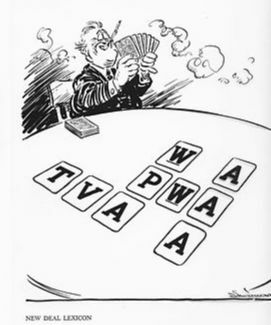 The PWA was important for Roosevelt’s three goals of economic recovery, job creation and investment in public work projects. For example, the PWA oversaw the creation of large infrastructure projects such as: bridges, dams, hospitals and schools. The goal was to create employment among working-class Americans which would, hopefully, help to reduce unemployment and increase consumer spending. While many of the programs of the First New Deal helped working-class Americans, the country was still burdened by high unemployment and the conditions of the recession. As such, in 1935 Roosevelt launched more initiatives, which historians refer to as the Second New Deal. Likely the most important of these initiatives was the Social Security Act of 1935. The act established several key features of the New Deal, including: a universal retirement pension benefit for all Americans, unemployment insurance and benefits for disabled and dependent children. It was significant because it signalled a shift in American politics, in which the federal government took a role in assisting Americans. Also in 1935, the government established the National Labor Relations Act, which is commonly known as the Wagner Act. The act guaranteed basic rights to workers including the ability to organize into unions. Throughout the 1930s, millions of Americans joined unions to protest for better working conditions and wages. 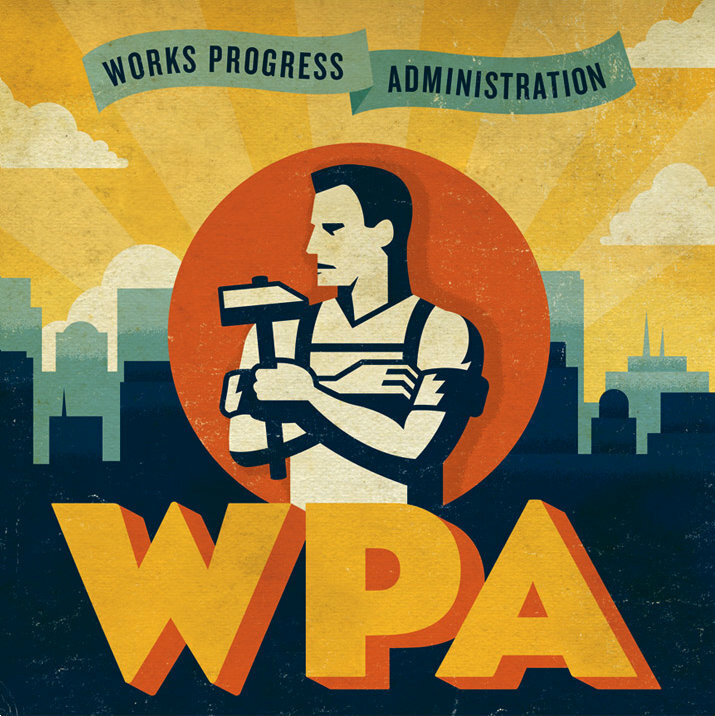 The next important part of the Second New Deal was the creation of the Works Progress Administration (WPA) in May of 1935. It was the largest New Deal agency and was created to employ millions of unemployed Americans during the years of the Great Depression. In general, the WPA oversaw large infrastructure projects, including: roads, bridges, schools, hospitals, parks and reservoirs. At its height, it employed more than 8 million workers and was responsible for over 650,000 miles of roads and highways. The WPA also funded projects to promote American culture in several different areas, such as: art, music, and theater. Regardless, the hardships of the Great Depression continued. While unemployment slowly improved after Roosevelt took office in 1933, it was still relatively high throughout the remainder of the decade. For example, the unemployment rate in the United States peaked in 1933 at 25% and lowered to about 15% by 1937. As such, while most historians agree that Roosevelt’s New Deal policies likely led to the American economic recovery after 1933, some critics argue otherwise. Specifically, supporters of Keynesian Economics argued that the New Deal did not go far enough in terms of providing social assistance to the working-class, while conservatives argued that the New Deal went too far. For example, following his electoral loss to Roosevelt, former President Herbert Hoover spent the remaining years of the Great Depression as an active critic of Roosevelt’s ‘New Deal’ programs. 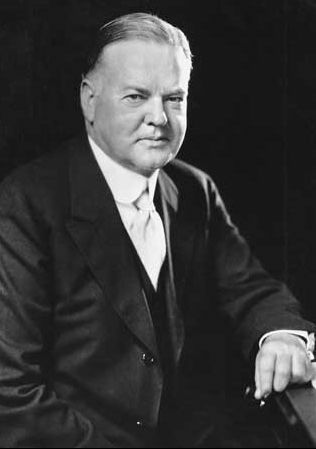 In his writings, Hoover argued against increased government involvement in the economy and warned against increased government debt to fund social-assistance programs. Nevertheless, the effects of the Great Depression were ultimately ended in 1941 with the United States’ entry into World War II. 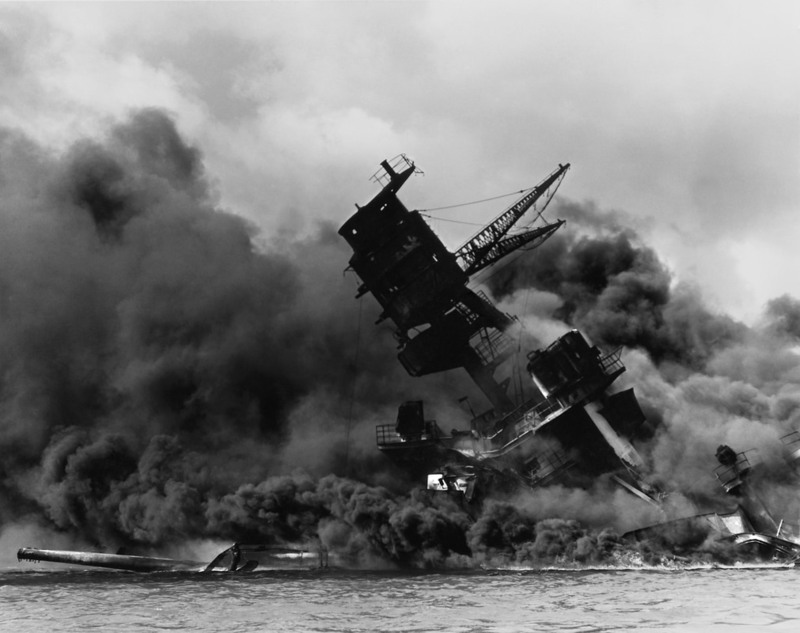 The United States entered World War II on the side of the Allies following the surprise attack by Japan at Pearl Harbor on December 7th, 1941. The war effort created millions of jobs for men in the armed forces and millions for American women in the factories that produced war supplies. For example, in 1941 the unemployment rate was approximately 10% but between 1943 and 1945 it was lower than 3%. The Great Depression was over. The New Deal was significant to the history of the United States because it involved a dramatic shift in politics and economics for the country. The implementation of the New Deal saw the United States combine aspects of socialism with its more capitalist history. In general, socialism is a left-wing economic system that favors government intervention in the economy in order to try to solve economic issues. At the time, socialist policies were popular around the world and were causing many countries to change their policies. American politics and economics had been much more right-wing in the decades before the Great Depression. This meant that the United States was based upon the principles of capitalism, which is the idea that the government should play as little a role as possible in the economy and allow people to have more control over their own economic wellbeing. The policies of Roosevelt and the creation of the New Deal fundamentally shifted the United States left on the economic spectrum to a form of capitalism that economists refer to as the Welfare State.